I love key chains! My favorite one is a wizard made by a blacksmith at a Scottish Games and Gathering in Woodland, CA way back in the day. I’ve made square ones and advertised them as condom holder key chains… They are a hit bachelorette parties! You can make these in any shape I suppose. Same concept. This is a great scrap fabric buster! My scrap fabric bag is OVERFLOWING!!! Cut out 2 circles. I cut out two contrasting colors. One outer fabric and one liner fabric. Cut out two of the half circles using the outer fabric. Fold the ribbon in half (now 1″). Pin to the edge of the out fabric pointing towards the center. 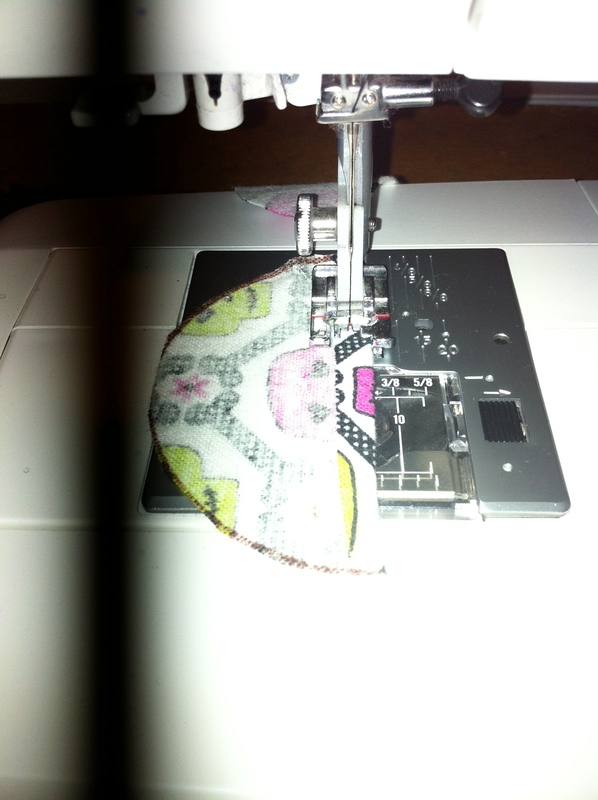 Pin the half circles (right sides) to the out fabric circle.The straight edges should be overlapping. Sew close to the edge around the circle. Remove pins, turn right side out. Press. Sew a top stitch close to the edge. Install the key chain ring.